Starting with a deceptively crappy first song – which must have been taken from some unreleased demo – this album fires satanic Black Metal missiles with technical and deadly precision. 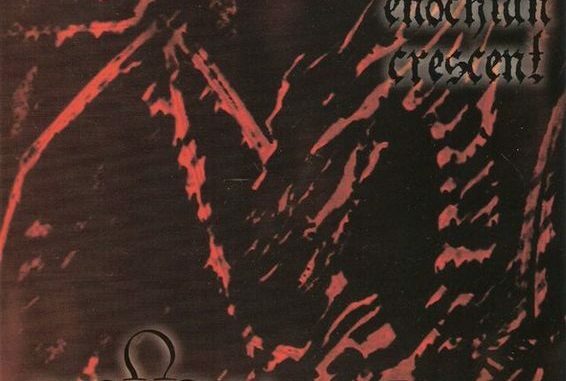 At least Black Metal is the base of all this – ENOCHIAN CRESCENT have no fears of contact with all other subgenres of metal which they blacken in their own specific way. Whether it might be heavy-Metal-like guitar playing, all styles of uttering lyrics in any conceivable way other than actually singing, Death-Metal riffing and even calm piano-parts – ENOCHIAN CRESCENT unite it all on “Telocvovim”. Although the band hails from Finland their lyrics are – besides english – only partial finnish. I recall reading in an interview with Wrath, the vocalist of EC, that some of their lyrics are in Enochian, a language induced to humans by angels. Wrath stated in this interview that he got his lyrics induced and has not written them himself. Combine that with the statement that EC rarely play live due to the reason that the good man lives a live experience as a ritual where he ends up cutting himself so badly he can’t possibly play two days after another and you know EC take their satanic approach seriously. Make of that what you want. But there is no denial that there is a certain shamanistic, if not trance-like, spiritual edge to the music of EC. And that is what makes them so special in my eyes: Wrath’s vocals are among the most widely varied, dedicated Black Metal vocals I have ever heard. On top of that, EC’s melodies are simply not of this world. Sometimes you hear parallels to …AND OCEANS’ strange disharmonies (with whom EC shared the drummer Grief) – these are melodies which make this album some kind of a ritual and add a big deal to the avantgardistic moments of this record. The best example would be the alien, dreamlike melodies on “Amma I Piad Sa Madriiax”. I have never heard anything as surreal and dark as this before with such simple measures. THROES OF DAWN would be another guess sometimes, and Bingo – we have members of them in EC as well (reeks of incestuous norwegian conditions here…). And last but not least, the varied drumming of Caer Hallam Generis (also known as Kai Hahto, ex-ROTTEN SOUND) does its best to make “Telocvovim” interesting – and succeeds. If you want a spiritual satanic experience performed with technical skills (seldom enough in Black Metal), run into the woods at fullmoon and don’t forget to bring your copy of “Telocvovim” with you. If you are lucky enough to catch one, that is. The most recent info I have is that “Telocvovim” is sold out.